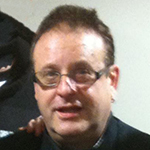 Dean Kennedy is The Divine Comedy’s tour manager since 1996. Originating from the Essex punk scene, Dean has been very involved in the Canvey Island musical scene. Dean was taught guitar by Dr. Feelgood’s Wilko Johnson, and in the late seventies Dean and his brother Warren played in the garage band Deeno’s Marvels. Later they’d form The Rubies, and then The Canvey Island Allstars. At that time Dean also became Dr. Feelgood road manager. It is said that he was so close to them that Lee Brilleaux (Dr Feelgood’s singer) loved him like a son. In 1993 when Lee Brilleaux and his manageer Chris Fenwick transformed the Oysterfleet Country Club onto The Dr Feelgood Music Bar, the place was run by Dean who made many artists playing there. Now the place has became the Oysterfleet Hotel, but he has still managed to organize concerts there, including a Divine Comedy fan club show in 2002. After Lee Brilleaux passed away in 1994, Dean moved to Jamaica for another of his passions: Reggae music. He played for and produced many Jamaican acts including Gregory Isaacs, Mikey General, Dennis Brown and Elvis DaCosta, with whom he founded his record company Imposter. In 1996, back in UK, he and Warren started their touring company and worked with many acts of the British scene including The Stranglers, Oasis, Edwyn Collins, The Charlatans, and The Divine Comedy. He introduced to Neil Hannon his friend Elvis DaCosta who joined The Divine Comedy on tour in 1996 and released a single together in 1997. He also managed Neil to duet with Alison Moyet at his birthday show in 2012.